Why these two stocks made unusually large moves on Wednesday. 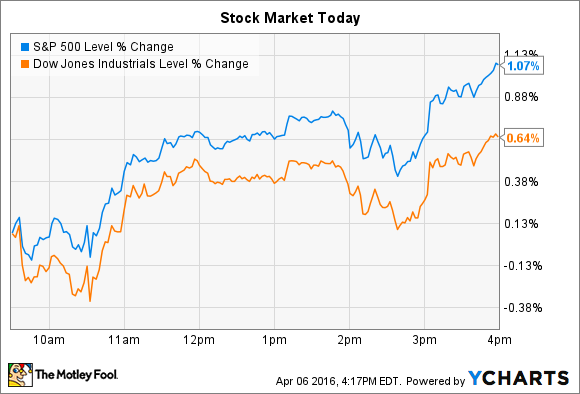 Stocks returned to rally mode on Wednesday by surging higher into the closing bell. The Dow Jones Industrial Average (DJINDICES:^DJI) added 114 points, or 0.6%, and the S&P 500 (SNPINDEX:^GSPC) gained 21 points, or 1.1%. The Federal Reserve released minutes from its March meeting that showed officials were debating staying cautious in their plan to raise interest rates. In fact, a rate hike in April, some members said, might "signal a sense of urgency they did not think appropriate," according to the report. The Fed starts its next two-day meeting on April 26, after which it may, or may not, announce another quarter-point increase to interest rates . Meanwhile, Constellation Brands (NYSE:STZ) and Cree (NASDAQ:CREE) stocks both made unusually big moves on Wednesday. Alcoholic beverage titan Constellation Brands jumped 6% and set a new all-time high after the company announced surprisingly strong quarterly earnings results. Sales rose 9% for the fiscal year to $6.5 billion and profitability expanded by 2 full percentage points to 28.5% of sales. That translated into $5.18 per share of profit, which was 24% higher than the prior year and ahead of management's January forecast of $5.10 per share . "It has proved to be another dynamic year of significant accomplishments and impressive financial results," CEO Rob Sands said in a press release. Beer again made the difference in Constellation's portfolio, with depletions up 12% on strong demand for the Modelo and Corona brands. Meanwhile, operating income soared by 24% as beer prices rose and costs fell. Constellation announced several other important pieces of news on Wednesday, including a 29% boost to its dividend payout, a $300 million purchase of The Prisoner Wine Company, and a potential spinoff of its Canadian wine business. In the meantime, Sands and his executive team project a stellar year ahead: Earnings should improve by 19% to $6.15 per share as the company eclipses $1.6 billion of operating cash flow -- up from $1.4 billion last year. LED specialist Cree dove 15% after management sliced their sales and profit outlook for the quarter that ended on March 27. Revenue is now expected to come in at $367 million, far below the $415 million that CEO Chuck Swodoba and his team forecast in early January. The company should just barely break even with earnings of just $0.01 per share, as well, compared to prior guidance for profit as high as $0.11 per share . Cree blamed the shortfall on three factors that combined to send its lighting products sales far lower than expected. Significant customer service disruptions due to an in-house IT problem pinched results, as did a delay in the production of new lighting systems. Finally, demand was generally weaker than expected. Management is hopeful that these issues will amount to a speedbump in an otherwise solid fiscal year. "While it's premature to provide specific targets at this time, the order rate in commercial lighting improved in March, and we're optimistic that this, combined with demand for new products, will begin to drive growth in fiscal Q4," Swodoba said in a press release. Given the significant swing in Cree's sales growth pace, though, it's understandable that investors would take a step back on this stock -- this quarter's decline could spell more than just a temporary setback.